People with autism often experience social exclusion, but this can be changed as a result of improved policies, support services and awareness among the general public. Children and young people with autism are often denied access to schools. Adults with autism often lack the support they need to gain and maintain employment. People with autism are often excluded in social settings where they struggle with interactions with other people. Each time a person with autism is excluded the effects accumulate, often leaving people with autism isolated within their communities. While people with autism struggle with social interaction and communication, that does not mean they can’t be included as valued members of society like everyone else. Social inclusion means having access to education, health care and services, as well as living in a society where other people make an effort to understand and include people who are different. It also means having one’s concerns taken seriously when asking for support. 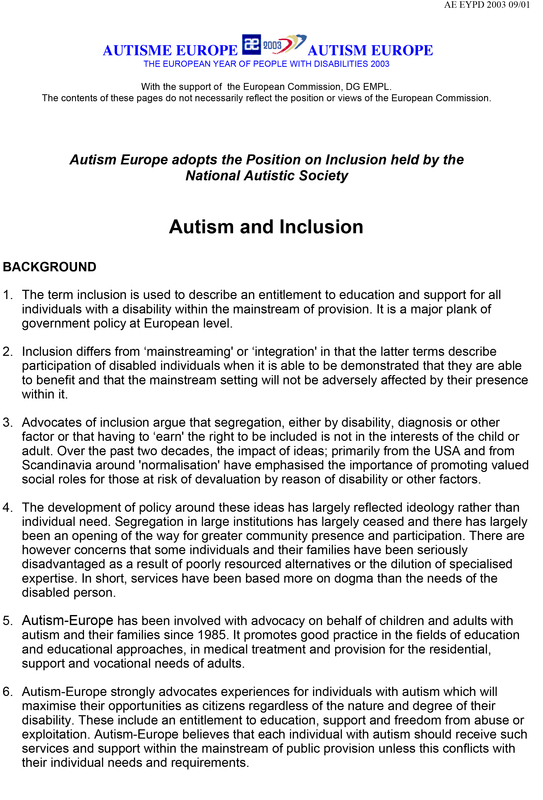 Autism-Europe works to highlight the need for social inclusion to policy makers and takes part in projects and awareness-raising campaigns to better include people with autism in all aspects of life. Under the United Nations Convention on the Rights of Persons with Disabilities, people with autism have the right to be included in their communities.